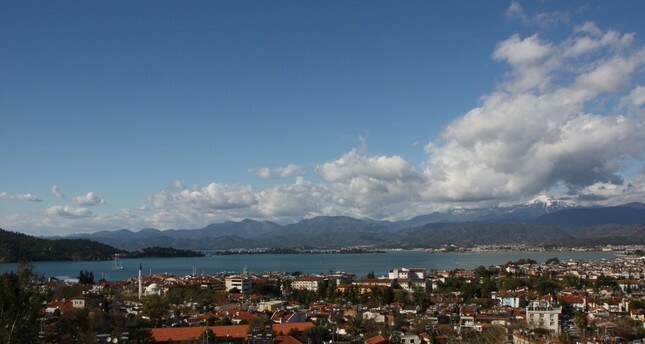 Fethiye is home to an expat community consisting of 7,600 foreigners. Muğla's Fethiye region is situated on Turkey's southwestern Turquoise Coast, where the Aegean meets the Mediterranean, and has always been considered one of the country's most stunning naturally protected coastlines. Boasting some of the nation's best beaches, spectacular ruins, stunning nature and the epic Lycian Way, it should come as no surprise that the area is fast becoming a haven for foreigners seeking a new way of life in Fethiye. Figures from Fethiye's Tourism, Culture, Environment and Education Foundation (FETAV) show that last year there were 7,600 resident foreigners in Fethiye. Considering that the population in Fethiye is approximately 150,000, this means that one out of every 20 people in the area is a foreigner who has chosen to make the area their permanent home. In 2003, that number was 1,500, which shows that over the past 15 years, the number of foreigners moving to the Fethiye region has multiplied fivefold. Meanwhile, the majority of foreigners residing in Fethiye are from the U.K., amounting to a whopping 5,200 British expats. Nicola Wilson with her children Lara and Kerem. I had the opportunity to ask a fellow expat and expert on what it is like living in Fethiye. Nicola Wilson hails from Wiltshire, Britain, but she has been living in Turkey for the past 15 years. Her home is in Ovacık with her two Turkish children, Lara, 12, and Kerem, 9, who go to school at Ölüdeniz Okul in Hisarönü. She works in Fethiye center as a writer and customer representative for YellAli Expat Services, a Fethiye-based service that assists expats in a variety of areas involving relocating to Turkey. But it was her mother who actually made the move to Turkey first, in 1998 relocating from England to Dalaman, where she ran a property development business. Nicola then spent her holidays in Turkey after her mother's move. In 2004, she decided to move to Turkey and settled in İzmir's Çeşme for eight years. But, her heart and mind remained in the Fethiye area, and she moved back about five years ago. "Fethiye is definitely my favorite area to live in. There is so much to do and see and everything is close by. Kayaköy, Fethiye, Çalış, Hisarönü and beautiful Ölüdeniz all offer a totally different vibe," Nicola shared adding, "I also like the way there is a lot catering for the expat community." When I asked her to elaborate, she said there are lots of organized events, special interest clubs, sports and shops selling foreign items. Nicola and her mother actually have their own British card shop in the center of Hisarönü called Celebrate that sells all sorts of British gifts, cards, decorations and holiday items. They also offer a delivery service in Turkey so expats can send special cards and gifts and can be found on Facebook as Celebrate Fethiye. Inside Celebrate, Nicola's shop, where she sells all sorts of British gifts, cards, decorations and holiday items. It's also possible to find familiar food items and British homemade baked goods among the expat community, while restaurants in the region offer traditional Turkish, British and other international cuisine such as Chinese and Indian food, Nicola explained. I asked Nicola which parts of the Fethiye area were most popular among expat residents to which she said: "There are expats living in all areas of Fethiye. All parts of Fethiye town itself are very popular. Çalış also has a large expat community as do Hisarönü and Ovaçık. There is also a smaller expat community in Kayaköy and Ölüdeniz." As for their nationalities, in addition to the strong British presence as well as significant number of Germans, there are also Russians, Chinese, Ukrainians and many other nationalities too. As for the main reasons why so many foreigners have chosen to make Fethiye their home, Nicola said: "Fethiye has a great climate and is a truly beautiful area, the nature and mountains are stunning. The beaches are beautiful such as Ölüdeniz and Kidrak, and there is lots of history in the area. Fethiye has an ancient amphitheater and lots of rock tombs scattered around the town and carved into the mountains. Nearby Kayaköy has a fascinating history and you can walk around the ghost town. If you are looking for excitement you can go paragliding, if you want peace and tranquility you can charter a private yacht. There really is something for everybody, so you can never get bored in this area. Each part of Fethiye offers something totally different." I asked Nicola if there were any hurdles faced by foreigners residing in Fethiye to which she said. "Turks and foreigners cohabit and get along well in Fethiye. Most locals do speak English and/or another language, which is helpful and people here are used to dealing and working with foreigners." There are also lots of Turkish lessons available for all levels. Some bars and restaurants have even started free weekly lessons for their customers.I asked Nicola how expats tend to spend their days in Fethiye and she said that many, like herself, have become Turkish citizens and work in downtown Fethiye or own businesses, while others are retired. Out of curiosity, I asked her what sort of businesses expats were opening in the area and she said, "It ranges from restaurants, estate agencies, property maintenance companies, foreign services and legal services to food shops, clothes shops and in fact all sorts of shops." And she should know, because Nicola also runs the Facebook group Hisarönü Local Businesses. "There is a laid-back atmosphere. People also spend their days helping in charities, joining local clubs and generally enjoying what the area has to offer. Expats tend to get very involved with the community in Fethiye and work together for several British-run charities in the area which help local children and schools, street animals and more," she shared. The Fethiye International Group (FIG) is one example of a group of volunteers running a charity that raises money for the benefit of local children, while Let's Keep Turkey Clean (Türkiye'yi Temiz Tutalım) holds cleanups in various areas to pick up litter. I asked Nicola if there were any social groups or clubs that expats take part in and she said that there were lots of sports, hobby and kids groups spread all over Fethiye. To name just a few she said there are groups that meet regularly for tennis, badminton, yoga, Pilates, aqua aerobics, bowling, walking and even line dancing. For the kids, there are also play groups and art groups, many of which are organized through Facebook. There is also the Fethiye Times website penned by a fellow expat that lists all of the expat-interest events and has a top-listed blog on Turkish Food called EAT.